Alternative energy will play a very important part in the smart grid in the coming years. Harnessing solar energy and wind energy drives reductions in carbon foot prints and cost. Key to successful management of these energy systems is communications. 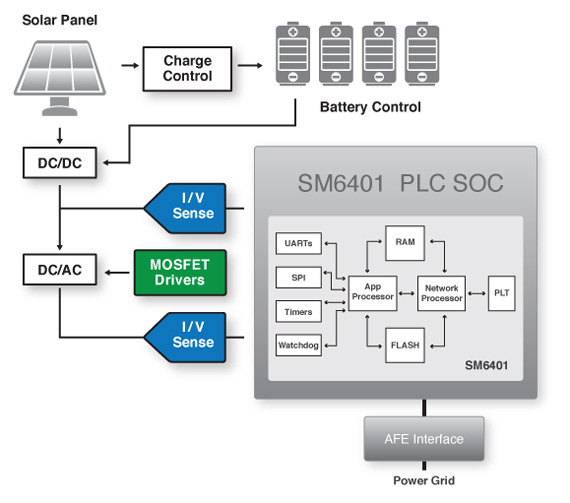 Semitech Semiconductor solutions enable our customers to design efficient and sustainable energy solutions. Photovoltaic panels (solar panels) must be carefully managed to provide optimal performance. This involves communications to enable remote control and real time monitoring. Remote control is used control the degree of tilt to maximize sun exposure and to control individual panels or an entire field. Real time monitoring enables maintenance monitoring, detection of silicon degradation/cell replacement need, weather conditions, theft detection, and power output, efficiency.